Francois Xavier Tourte and Dominique Pecatte never used a Lucchi meter. In fact it was not until the late 20th Century that the first Lucchi meter was developed. Today however, the Lucchi meter has become so ubiquitous that the pricing of bow blanks is directly tied into the Lucchi meter reading. So what is this device and how does it work? In addition to bow blanks, the Lucchi Meter can be used to measure various types of materials, including violin wood, piano wood, wind reeds, etc. Dealers in bow wood find the Lucchi meter a very useful device. It provides a basic system for classifying and pricing wood. For bow makers it reduces the guesswork involved in evaluating the potential tonal properties of a stick. The measurement of both pernambuco and brasilwood presents a very interesting comparison in this regard. As we all know, pernambuco, because of its high resistance and elasticity, is the most sought-after wood for the production of fine bows. The Lucci meter measurements corroborate this distinction: a piece of brasilwood ranges from 4.200-4.950 while a piece of pernambuco has a range of 4.350-6.130. This higher number represents a greater velocity and thus, given equal density values, the pernambuco will have much more elasticity and better tonal properties. However, the Lucchi meter does have its limitations. Most importantly, a Lucchi reading only tells part of the story of a piece of wood. In evaluating a bow blank for example, the quality of the wood itself, and of its grain, the nature of any flaws, if they exist, as well as the overall density of the stick are all extremely important. Thus, two pieces of wood that have a similar measurement on the Lucchi meter may yet be of differing quality. To give an example, a piece of wood that has a very low density (otherwise known as a floater) might have a high Lucchi reading, but it is not going to be a very good stick regardless of that reading. Put another way, take two blanks with an identical Lucchi reading of 5800, but one weighs a normal 1.25 gms per cubic cm, and the other weighs .90 gms per cubic cm, a “floater.” You could fashion a 60 gram bow from both, but in order to do so, you would have to make the floater much larger in circumference to compensate for its lower density. How important the Lucchi measurement is in evaluating the quality of wood is still very much a matter of personal preference. Some of the bow makers I talk to are not at all concerned with the reading. They simply want to see the wood itself. For these makers experience, and the empirical knowledge which they have built up over years of dealing with the material is more important than any information to be gleaned through technological advances. Most bow makers however agree that the Lucchi meter is, to varying degrees, a useful tool. While the example of comparing brasilwood to pernambuco simply confirms a well-known truth, there are many other cases where reliable, useful information is far more subtle and elusive. In evaluating two pieces of wood that are similar in many respects, using a combination of instinct and technology can be a more sensible means to judgment than relying solely on one or the other. More information on the Lucchi meter can be found at G. Lucchi & Sons. 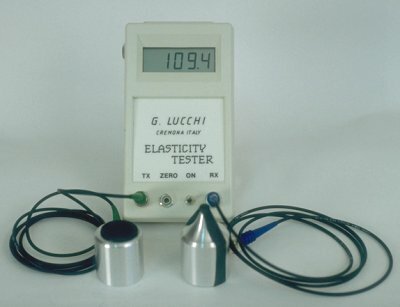 The Lucchi Meter may be purchased through BowWorks. The Indian name for the wood of the pernambuco tree means, “red stick.” “Braza,” which gave Brazil and brazilwood their names, is an Arabic word meaning bright red. The Brazilian Indians put the vaunted tensile strength of pernambuco to good use in fashioning weaponry from it, but they also valued its medicinal and tonic properties. The red pigment in the wood of pernambuco tree was used as a dye, first by the Indians to color their ceremonial feathers, and later by the Europeans for fabric, wood finishes, and even cosmetics. Like so many tropical and sub-tropical forest plants, pernambucco is under investigation for its possible usefulness in the modern pharmacopoeia. So far, it has shown great promise in inhibiting the growth of cancerous tumors. The chemical brasilin, itself colorless, produces its red pigment brazilein upon oxidation. Hence the wood exposed to air and sunlight is reddest. From King’s 1898 American Dispensatory: Red Ink—Take the shavings of pernambuco wood, Caesalpinia echinata, 4 ounces; diluted acetic acid, distilled water, of each, 16 ounces; boil together until 24 ounces remain. Then add 1 ounce of alum, evaporate to 16 ounces, dissolve 1 ounce of gum Arabic in it, strain, and add 1 dram of chloride of tin. Following the discovery of the new world, and the opening of trade routes there, the dense, rot-resistant and extremely heavy pernambuco was used as ballast on ships returning from South America. The scientific classification of the botanical varieties of the Caesalpinias is still in its infancy, and may at this time include some plants that don’t in fact belong to the group. The genus is large and varied, with some two hundred species spread over four continents. It takes approximately 30 years for a tree to develop sufficient heartwood to be useful for bow making. Next: A Scandal for All Seasons?